Home / STORE / Nisse / Nisse Group Black. Such a contrast but an absolute delight! 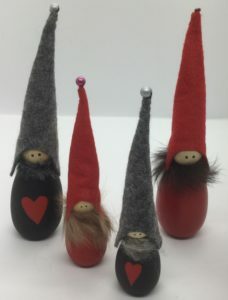 These Nisse want to show how much they love you. With Grey pointed hats adorned with a grey pearl, they wear deepest black with a beautiful bright red contrasting heart upon their chests. They stand approx 12cm or 17cm high. Collar colour may vary slightly.